Let’s start by going over how your septic system works. Wastewater from the home flows into the tank where heavy solids (sludge) settle to the bottom and grease and light solids (scum) remain on the surface. Naturally occurring bacteria break down a portion of the sludge and scum. Since the bacteria can’t break down everything, this is why the tank will need periodic pumping and cleaning. The remaining wastewater moves into the drainfield as more wastewater enters the tank. The drainfield is a series of pipes and gravel which filter the wastewater before it eventually enters the soil. The amount of water your home or business uses in a day has a significant impact on how well the septic system filters wastewater. Too much water at once, such as on a heavy laundry day, and the system can’t properly filter scum and sludge. This material can then clog the pipes and gravel layer, causing a soggy drainfield among other issues. 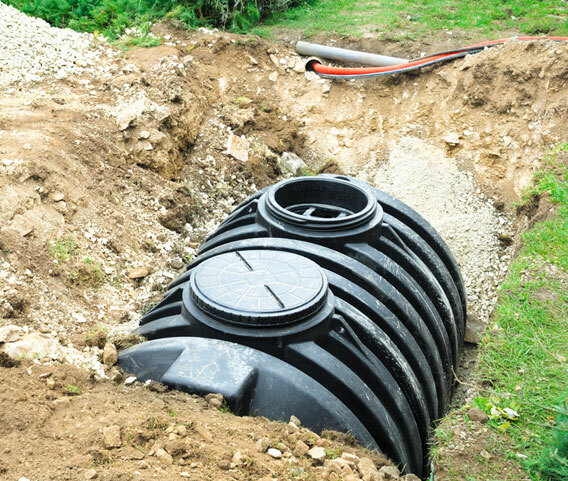 A septic system can last decades, from 15 years to 20 years for a steel septic tank and up to more than 50 years for a drainfield. Yet, the longevity isn’t guaranteed and there are several things you can do to help your system reach the upper limit of its functional lifespan. Part of the septic tank services we offer are annual inspections. During an annual inspection, we can determine its age, how efficient the system is, and what septic system maintenance should be performed. If you’ve purchased or moved into a home with a septic system, you may not know this information though it is important know and have on-hand. Believe it or not, septic systems can be difficult to locate. A good place to begin is by following the direction of the sewer pipe leaving the building. Once its location is determined, an insulated probe is used to find buried piping and the tank itself. Some digging in the yard may be needed to check the ports, but checking connections means making sure the household plumbing is going to the system correctly. This includes flushing toilets, using the washing machine, and/or running water in the sink. The depth of these layers will determine whether septic tank pumping is needed now or in the near future. If the sludge depth equals or surpasses one-third of the liquid depth, the tank needs to be pumped. How often the tank needs pumping hinges on the tank size, number of people in the home, and household habits. Your septic system relies on natural bacteria, or living organisms, to work properly. If what you’re thinking about flushing down the toilet or washing down a drain can easily be put in the garbage, do that instead. The key is to limit the type and amount of solids entering the septic system. Too much and you’ll need septic tank cleaning more often than not. Plus, the groundwater can be polluted by household chemicals entering the drainfield. The appliances we use every day play a significant role in how much extra septic tank maintenance your system will need. Generally speaking, garbage disposals shouldn’t be used when you have a septic system, as they can add up to 50 percent more solids in the tank. If you have a hot tub and are going to drain it, rather than draining the water into the septic system, let it cool and drain into the yard or other landscaped areas. Too much water entering the system at once can overwhelm it and instead push solids into the drainfield prematurely and create clogs and a costly drainfield failure. The less water flowing through a septic system, the longer the system will last — and with fewer issues. While it relies on water to treat and dispose of waste, the drainfield has an absorption capacity. Once the capacity is reached, unless the amount of water flowing to it decreasdes, the drainfield is at risk of failure. A drainfield failure requires emergency septic tank repair. The potential causes of septic tank issues are nearly as many as the symptoms of a problem. Plant and tree roots growing in the drainfield and tank. Soft spots in the ground above the drainfield or tank. If your septic system has any of these issues, call Jones Plumbing & Septic Tank Service to schedule a septic tank cleaning and inspection. Our technicians use cameras, mirrors, and other tools to safely inspect the system and locate the source of the problem. If necessary, we’ll pump and clean the tank before checking for structural issues. A properly maintained septic system will give your home or business years of dutiful service. When you choose Jones Plumbing & Septic Tank Service, you’ll receive professional service backed by the most current information, techniques, and methods available. Our team has more than 30 years of experience in septic services, including septic tank installation and septic tank replacement. When it comes to caring for your septic system, Jones Plumbing & Septic Tank Service has you covered!